The Nisaku Japanese Hori Hori landscaping tool is a concave stainless steel blade designed for scooping soil and other materials. This allows it to serve a dual purpose as both a shovel and a knife, and means that it’s very easy to dig straight into tough ground. Uses include scraping weeds, roots, and vegetables, as well as planting, transplanting, weeding, removing plants from pots, sod cutting, and more. The manufacturer describes it as a ‘Swiss Army Knife for gardening’, which perhaps explains why the name is rather obtuse (‘tool’ rather than ‘shovel’). Interestingly, the multi-functional nature of this tool also lends itself well to a range of other applications, such as hunting and fishing. As well as being a very practical tool, this is a very nice looking one. Itis made with an attractive wood and minimal design. It looks great in any collection and is generally a joy to use thanks to this. The stainless steel blade should also last a long time and prove to be resilient against rust and other types of deterioration. The blade is 6½ inches and the entire length of the tool is 11¾ inches. The product is made in Japan, so is going to be of a much greater quality than most of the Chinese made Hori Hori knives. One nice added feature is a heavy black vinyl plastic sheath that makes it easy to carry around and transport, and which protects the blade from rust and damage when it is kept in the shed. A handy belt loop adds to the multi-purpose nature and means you can keep it on your person when gardening, camping, or hiking. The handle of the tool itself also comes with a small hole near the base, which makes it useful for hanging from a screw in the shed or on a hook. The blade comes with one smooth side and one serrated side, which further gives it a wide range of uses. The only thing potentially absent is more of a handguard, though this shouldn’t be an issue for most uses. The Nisaku Japaneses Hori Hori garden landscaping tool currently has a very impressive score of 4.7 out of 5 stars on average on Amazon. This is based on 706 reviews at the time of writing and it appears that users appreciate the tool’s great build quality and attractive look. Many found that the size and design was useful for a wide range of different tasks. 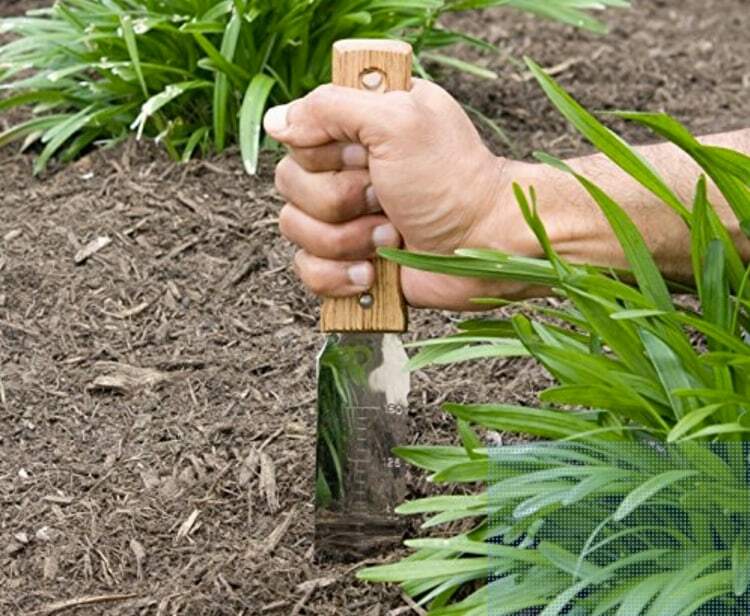 They appreciate that it is made of an extremely solid Japanese steel, which is capable of easily cutting through clay soils and makes weeding a breeze. Many uses also commented on how useful having a serrated edge is. Making it an ideal tool for sawing through tough roots. As it is rust resistant and made of quality metal it is expected to last for a very long time, with many reviewers pointing out that they expect to get years of use out of it. Criticisms regarding the knife tend to be aimed more at suppliers rather than the design of the tool itself. Specifically, some people found they received knives without a serrated edge, which seriously limited usefulness. As long as you buy it direct from Amazon, you should be able to avoid this issue. Overall, this is a very well-made tool that has a thoughtful design lending it multi-purpose functionality. If you want a knife/shovel that will look great in your collection, this is a good bet! Buy this great alternative Evolution Small Stainless Hand Trowel (Extreme) With Teeth product on Amazon.co.uk using this link.